Commence periodic alarming shrieks of agony coming from the living room and consumption of massive amounts of beer, pizza, wings, chips and………pause for effect……..guacamole. I’m sorry super convenience lovers, but with guac…freshly homemade is the ONLY way to go. It doesn’t involve a lot of ingredients. It doesn’t take all day to make. You’re running out of reasons not to make your own. Ok, ok so it’s not as fast as ripping open a container but who wants to deal with those weird little vacuum sealed bags it comes in so you have to squeeze oddly flavored green goo into a little plastic container anyway? I bet you will too. Especially after you’ve tasted this. 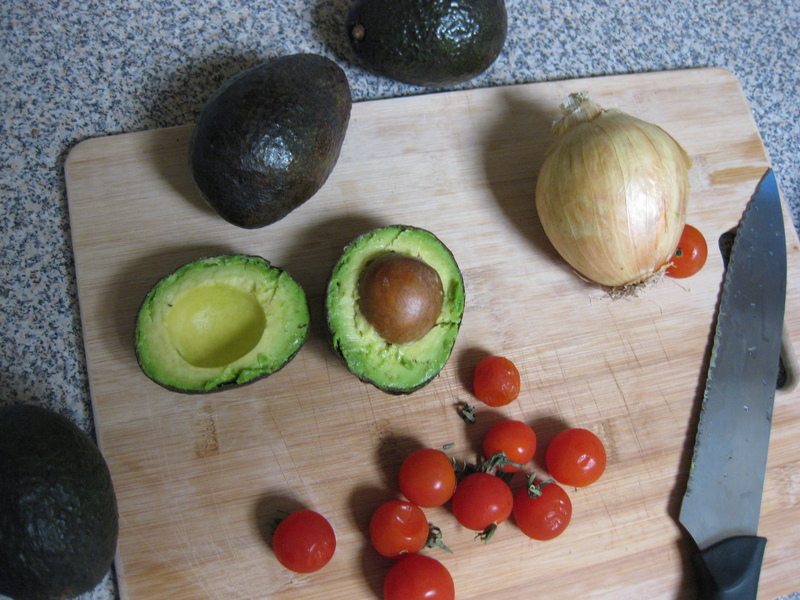 You just need some ripe avocados (we’re goin 4 avocados), an onion, and a handful of cherry tomatoes. Also honestly….you don’t even need the onions and cheery tomatoes! You could have JUST avocados and be good to go. We need to get those avocados into a bowl to mash them. Cut them in half and open them like a book. 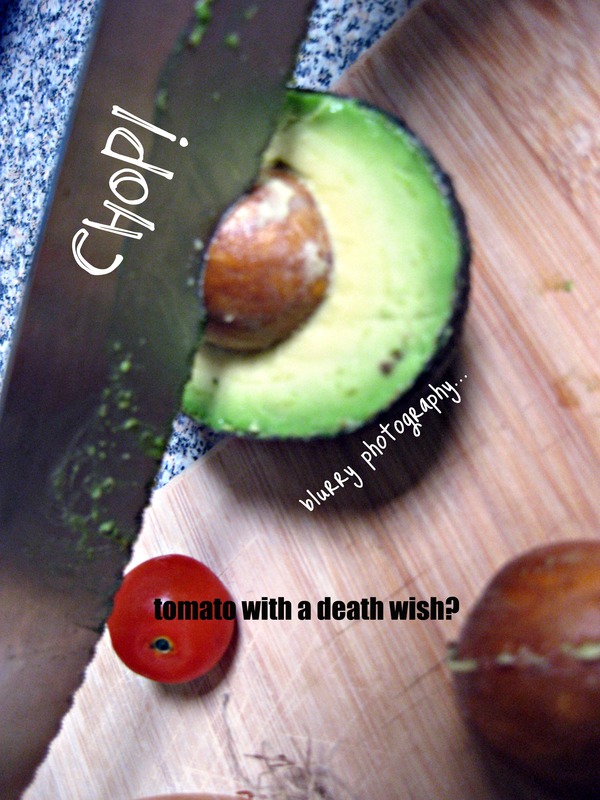 I’m going to teach you a trick and officially smash your last reason not to deal with avocados! Now just take a spoon and run it between the skin and the meat of the avocado. Pile it up in a super appetizing bowl of green mush! Which we will make delicious. Now just smash them up, dice half your onion and chop your cheery tomatoes into quarters. Note: I like cheery tomatoes because they hold their shape better when you cut them up. You could use just one big tomato but then you’ll have guac with tomato guts rather than guac with tomato pieces. Still delicious. It’s completely your call. Throw everything your bowl with juice from about half a lime, salt to taste and a DASH (seriously we’re talking not a lot here at all just a hint) of garlic powder and LOOK! It’s it’s like a tasty Mexican flag in a bowl! Which you should immediately consume with chips. If you happen to have leftovers..
…cover it with plastic wrap and press it down so that it literally touches the guac. There shouldn’t be any air between the covering and the guacamole. That way nobody turns brown and everybody is happy. 1. 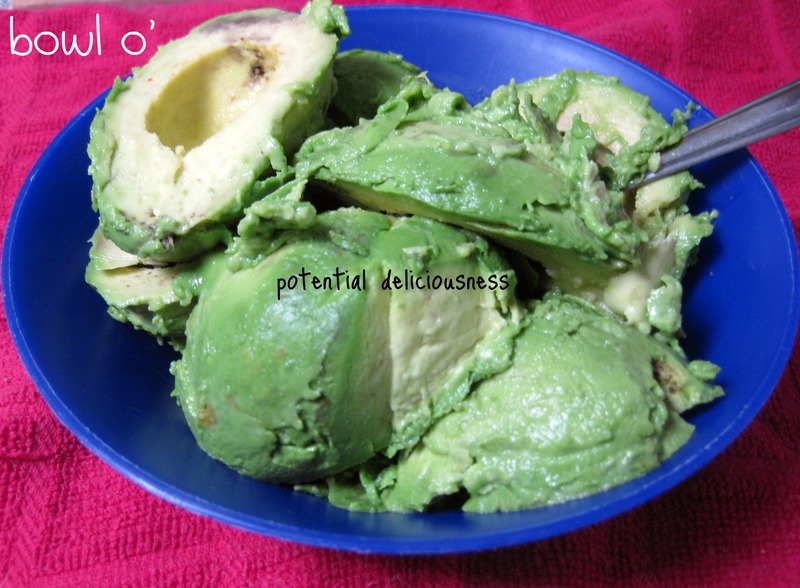 Cut the avocados in half, remove the pit, and spoon the meat into a bowl. Mash with a fork or potato masher until it reaches the desired consistency. Cheery tomatoes?? A tomato with a death wish?? This is what happens when you play with your food. Glad you’re having fun. I am, too. And this stuff is too delicious. Is that leave-the-pit-in idea fact or fiction? I’ve heard it before…let’s clear that up. Browning is due to oxidation. 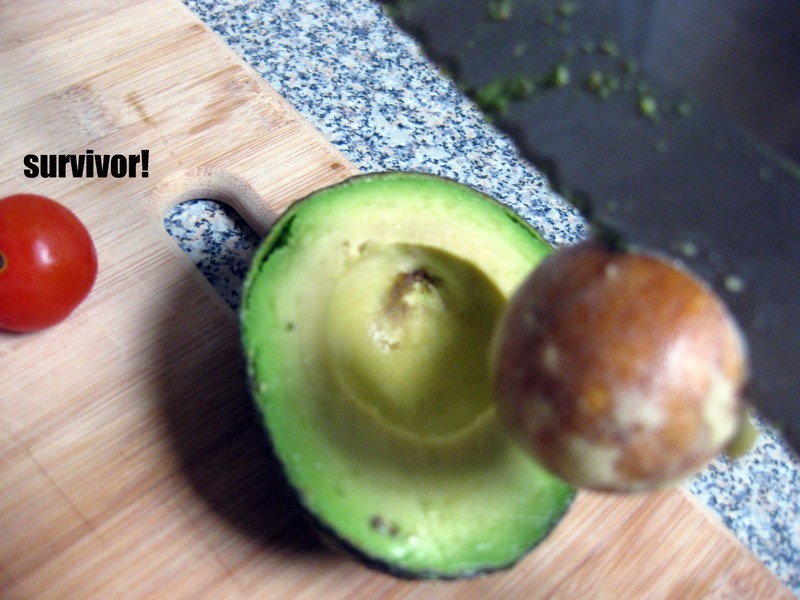 In order to prevent oxidation absolutely no air may reach the surface of the avocado. Ascorbic acid, found in both lemon and lime juices, helps to prevent oxidation as well. Therefore, leaving the pit in half an avocado that is still in the skin and not mashed up or anything and ALSO spritzing the cut surfaces with lime juice AND covering it with plastic wrap so that no air reaches the flesh will keep it green. In this case, leaving the pit in just conveniently seals that hard-to-reach hole it would have left if you took it out. 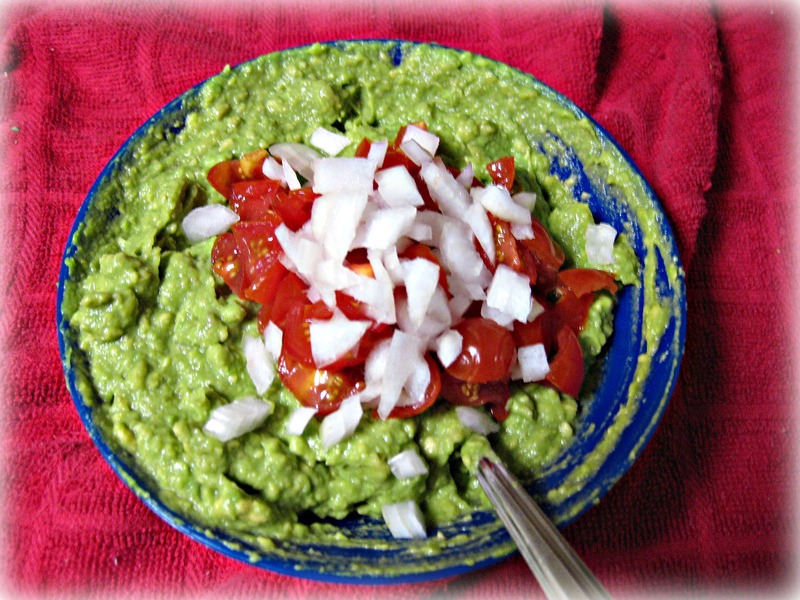 Guacamole is a little more difficult because the mashing process incorporates air. There IS lime juice in it, though, and if you press down the plastic wrap it will keep overnight….just probably not longer than that. Moral of the story: EAT YOUR GUAC!